The number one fear of any early retiree (or any retiree living of investments for that matter) must nearly be a bad sequence of returns early in retirement. I can only imagine the emotional rollercoaster of watching a stock market fall in value by more than 80% in real terms (like the US market did during the Great Depression), rebalancing into it continuously, while knowing that you’re no longer working so ‘can’t’ replenish and then on top of that then being forced to sell down capital to live off. With this in mind and for some time now I’ve been trying to build my portfolio in such a way that I can live off less than the dividends received at FIRE (financial independence retired early), which will allow a little for reinvestment during the good times, while providing some protection during periods of falling dividends. 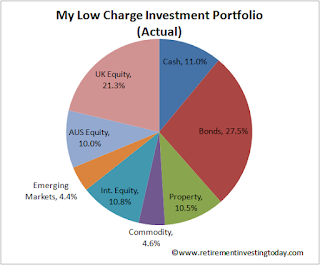 The methods I've used to do this have included the addition of a High Yield Portfolio (HYP) and moving from accumulation funds within an expensive work insurance company defined contribution pension to income funds within my own SIPP. With this in mind I’m today going to conduct a little thought experiment. Will I have enough dividends spinning off in FIRE to avoid selling down wealth during a severe bear market? Now before I go on I’m of course aware that past performance is not a guide to future performance. To keep it simple I’m also going to use the US market as a proxy for my ‘global’ equities portfolio which of course is not 100% accurate but I have a good dataset for the US (unlike other countries). Hopefully it will give a bit of steer as we do know global equities have a high correlation with each other plus this is just an order of magnitude thought experiment and I’m not chasing perfection here. 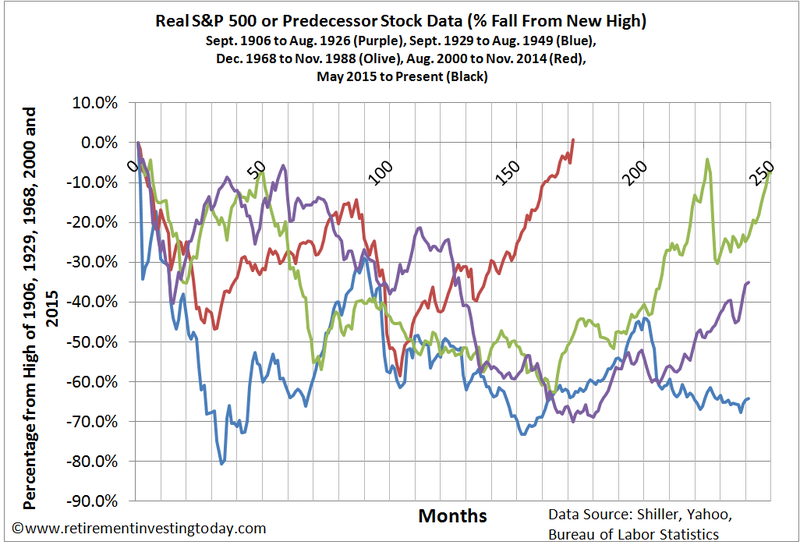 The purple bar in 2015 represents my forecast to year end 2015. Otherwise I segment via non-wrapped (ie not tax efficiently invested), SIPP and ISA. If this comes to pass then 2015 should yield £19,326 in dividends. I now need to jump forward to my FIRE date. Firstly, I need to subtract £5,885 as for some reason one of my few remaining active mutual funds has been paying off far more dividends than are sustainable. I'm then going to add on 24.5% as that’s the amount of capital (which should proportionally increase dividends) I still need to accrue compared to what I have today to reach my £1,000,000 minus home purchase, stamp duty, car purchase capital wealth target. Combining all of that and I could be receiving dividends of £16,729 at the point of FIRE. Now I already know how much I believe I’ll need to live well in FIRE. That’s £14,345 per annum or 86% of the total dividends above. Going forwards I’m now going to correct everything into after inflation real terms meaning we will always be talking in today’s pounds. Working in a clockwise direction. The cash plus about half of the bonds (which is my NS&I Index Linked Savings Certificates) won’t exist soon after FIRE as that is allocated to the family home purchase. The remaining bonds are Index Linked Gilts (plus admittedly a little ISXF which will ignore) in tracker fund form which no longer give any yield but the value of which should hopefully keep pace with inflation. The property portion is REIT’s / Property ETF’s and so behave quite like equities and do spin off regular dividends. The commodities portion just sits there collecting dust and certainly doesn’t give a dividend as its just shiny gold the precious. 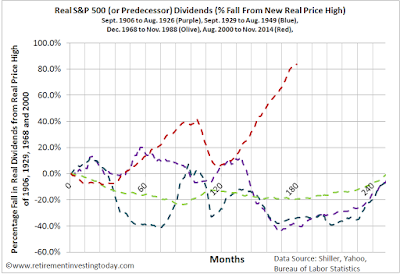 Which then leave equities in various guises which all do spin off dividends. If I squint at that lot all of my dividends are therefore coming from ‘equities’ only thus my decision to use the US market as a proxy. Next let’s frame up what happens to dividends during a bad bear market. 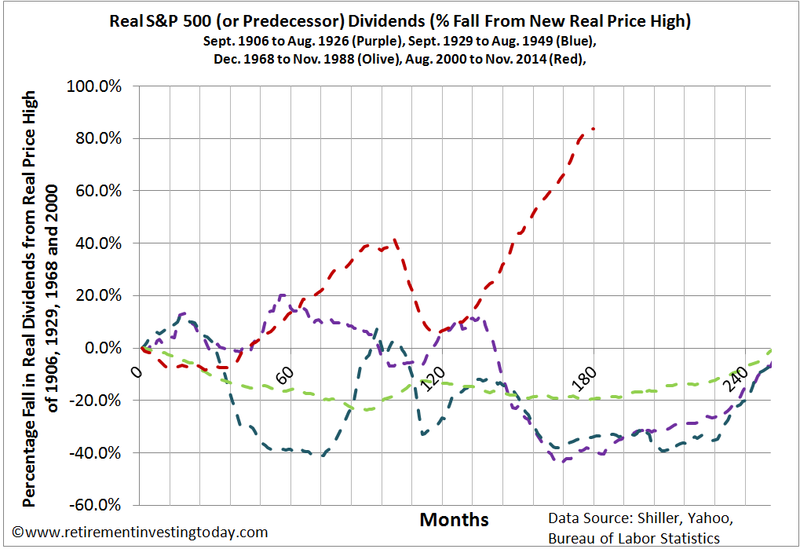 For this I’ve looked at the real dividend performance during the same bad bear markets shown in my first chart. 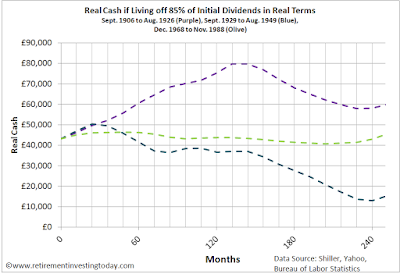 What is very interesting is that while the dividends all fall in real terms the most severe is a relatively benign 40% compared to the 80% real capital value of the equivalent period in the first chart. Ok that’s all the background data we need. 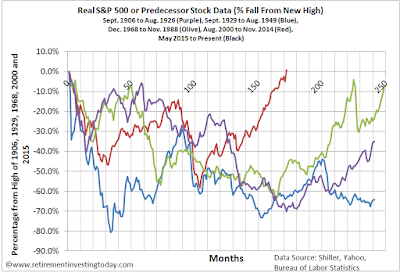 Let’s now see if I’d be forced to sell down capital if my ‘equities’ behaved like some of the worst US bear markets. I have read on places like the Motley Fool HYP Board in that past that one should always hold circa three times one’s annual expenses as cash to insure against a crash so let’s start with that. That’s £43,035 which could easily be accommodated within the ‘bonds’ portion of my portfolio by FIRE. Now let’s let those bad bears play out while I spend a real £14,345 annually. That’s pleasing to see. 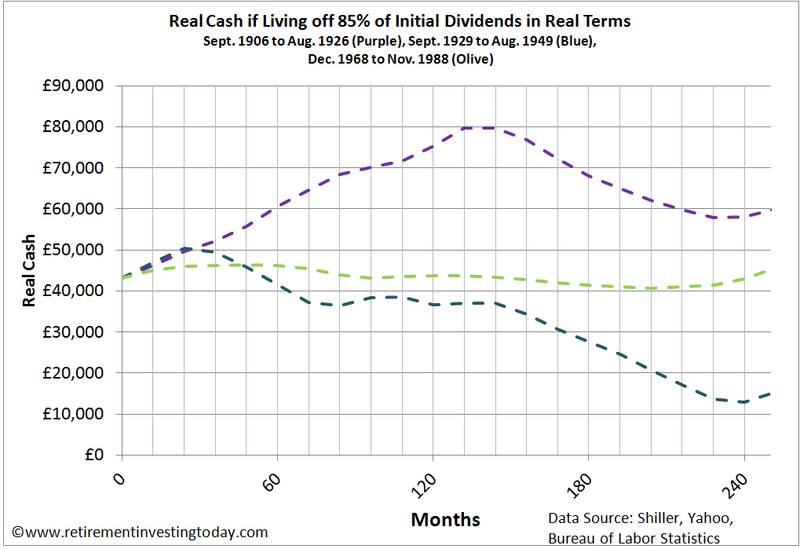 The 1906 crash which included the 1907 Bankers Panic doesn’t even dent the cash buffer. The period including the Great Depression certainly does make a dent but the buffer stays just above £10,000 before being on the turn after 20 or so years. It’s then nearly 20 years until the next bad bear which is plenty of time to rebuild the cash buffer. We then hit the period which included the collapse of the Bretton Woods Agreement as well as the 1973 Oil Crisis and see a dip just a little below £40,000. Finally, I haven’t even bothered plotting the period covering the Dot Com Crash and Global Financial Crisis as by inspection that looks ok.
What are you doing about sterling depreciation? When you reach £1m but move to the Med could your pot and income plunge if sterling drops against the Euro? as if sterling would plunge against the euro, LOL. great post RIT. Your approach looks likely to be super solid, but I think we kind of guessed that it would be, considering your fairly conservative balancing. fingers crossed it does indeed work out this way! Thanks for the support M.
"accumulation funds within an expensive work insurance company defined benefit pension": defined contribution? "minus car purchase": assume you buy cars at two years old. You'll still need a new one every five to ten years, won't you, depending on whether local roads are salted? "how much I believe I’ll need to live well in FIRE. That’s £14,345 per annum": good luck with that. You could easily spend half of that each time you replace a car, half of that each time your property needs a substantial bit of maintenance or updating, etc. Do you really think that two of you can live on that once you've allowed for those "exceptional items" that might crop up far more often than you expect? Especially when you reach the age where repairing a car yourself looks less and less appealing (and is anyway less and less possible for the amateur), and so does house maintenance, decoration, and so on. I infer that you are going to have to live somewhere hot, without air conditioning, and with low heating bills, and, you hope, low property taxes. You'd better hope that medical and dental bills are going to be low for the rest of your days. Otherwise "live well" might be overstating it. Remember that "southern gentlemen" - Thomas Jefferson and so on - often lived in a permanent morass of uncontrolled debt. That was one reason for the War of Independence - so that they could renege on their debts to London merchants. In Southern Europe it may be that people who renege on their debts suffer a rather gruesome fate. And then there's the possible political fate of chunks of Southern Europe as the current Volkerwanderung/invasion proceeds. It seems to me that you are being pretty optimistic. As always thanks for your thoughts dearieme. "defined contribution?" Duly corrected, thanks for the spot. For more details it might be worth popping back to the My Spending post. The £14,345 is a UK analysis of what I'd need in FIRE and includes £2,500 pa for a car (inc £1,000 of depreciation so I can replace as each wears out) and £3,500 pa for home repairs/depreciation. I'm also including £733.30 for Class 3 NI to keep building a State Pension. I've just looked at my latest spending tracker and excluding work and rent I'm currently spending £7,945 pa. So adding those together and I'm still close to the £14,345. 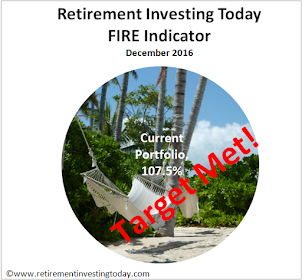 I intend to keep tracking right up to the point of FIRE to know what I spend over a long period. In the background (will probably share at some point once I put it into a presentable format) I've also run detailed simulations based on my research, including on the ground, for Spain and Malta. The spends vary but the £1 million still seems to cover. Spain and Malta are going to mean much less on home purchase meaning more 'income'. However on the flip side both will mean I slip back into the world of taxation. Additionally, in Spain we'll have to pay a years private healthcare and then we'll be up for the Convenio Especial annually. In Malta it will be healthcare via SSC contributions. In Spain the equivalent of Council Tax is much less but in Malta there is none. In Spain we'll need a car as well. In Malta I've allowed for it but I actually hope we won't need one. I spent 4 years of my life without one previously and I must admit I prefer to be without than with. "I infer that you are going to have to live somewhere hot, without air conditioning, and with low heating bills." I've spent plenty of time in hot countries without A/C. My experience is that if I'm suited and booted it's very uncomfortable, nearly unbearable. If I'm dressed for the region in 'casual' attire then I'm more than ok.
"medical and dental bills are going to be low for the rest of your days." That is always the risk but just how do you plan for it? I'm already being pretty cautious - 2.5% spend max (likely 2.1% at current simulations), only spending dividends, budgeting to build 35 years of NI contributions for state pension but planning on receiving none. Just when do you stop planning for the worst case and go for it? "Just when do you stop planning for the worst case and go for it?" Indeed. Similarly a person renting is probably going to find it hard to appreciate property maintenance and repair bills, and a person with a company car motoring bills. Have you ever had to replace a catalytic convertor or a diesel particulate filter? It ain't cheap. On top of that add £350k for a home, £7,500 of stamp duty and a half decent car and I'm just over the cool million as of today. If only I could get dentistry on the NHS. As a Londoner I'm paying full private whack and that's within the £7,946. You're right that this may increase as we age but I hope my contingency will more than cover these types of eventualities. Doctor wise we've always been NHS. Always found if you are genuinely ill that the service is excellent. Will the NHS charge someday is of course a different question altogether. I've owned a car in the past and have a reasonable idea of running costs. Would you disagree on £2,500pa to run a small car that is not used for a daily commute and so will see probably <8,000 miles pa? Property wise I've canvassed home owners. For a small 3 bed home £3,500 seemed adequate. Do you have any experience here? Sleeping in a hot Med climate without A/C. Now that's a problem I'm not to worried about :-) On a serious note have spent plenty of time in cheap non-A/C hotels/houses in very hot and humid countries over my career thus far. Ceiling fans are more than adequate for my needs. Whether that changes as I age is another story altogether though. "Would you disagree on £2,500pa to run a small car that is not used for a daily commute and so will see probably <8,000 miles pa?" Seems reasonable: I suppose you could compare with AA figures. "Property wise I've canvassed home owners. For a small 3 bed home £3,500 seemed adequate. Do you have any experience here?" Our experience isn't very helpful since we skimped in the busy years and it's been catching up with us since. Darn it. Hi RIT, I think your planning is incredibly thorough and I'm impressed with the depth of your research. I would also add that motorbikes/scooters are considerably cheaper if you really need to cut expenses! I'm with Matt on the car maintenance - I've never had a company car, took the cash option, but if you're spending £1500 p.a. on car maintenance you either have a Beemer or you need to change that sucker out, it's reached end of life. The amount you are looking to live on seems exceptionally low to me - my target is about £20k pa and that's me, myself, I income, not household. Granted I don't spend anywhere near that much at the moment, probably less than your 15k. I guess this is the difference between extreme early retirement and just plain early retirement - from what's implied by some of your charts your job pays a lot more than mine did. House maintenance costs are hellaciously lumpy. Landlords seem to figure about 2% of cost p.a. for that sort of thing, it is a bit less for me. Learning the basics of plumbing and a modicum of DIY help there, if only to qualify what you are being quoted. Very interesting scenarios, RIT. As usual, great to see that your plan is still on track and valid. One way to account for this is to build up a fund of term deposits for your actually spending - (laddering) I've got the next 24 months covered in six month blocks. Early next year I'll add to this with another two six month blocks. 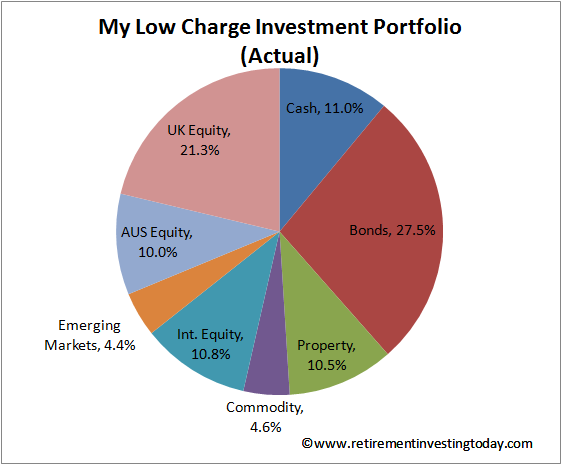 The income from investments more than covers each block and give's me a three year period to make changes if needed. If you try this before you stop working you'll know if it's realistic. Thanks for the post, RIT. What I think many people find amazing is your low day to day spending. Given the figure above, I think that is about £670/month for two people including rent. For such high income, that is an amazingly frugal feat. 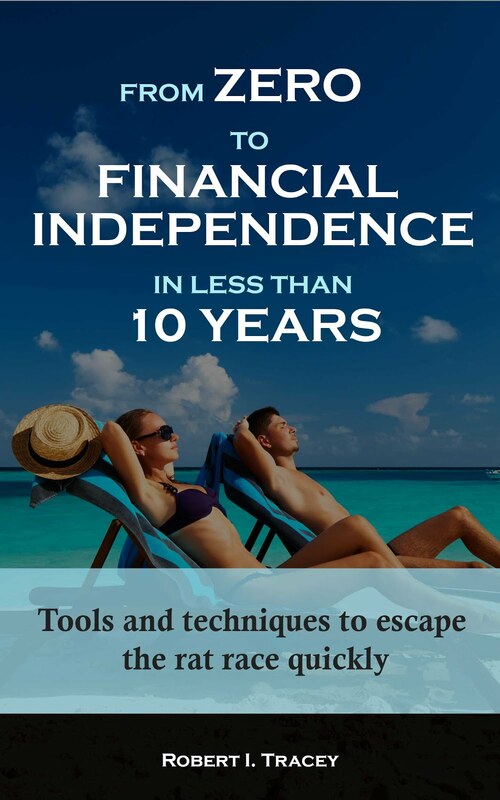 Personally I've always thought living off the income alone was the safest and simpest approach if you're not going to put it all into an annuity. With modern medicine going the way it is we could all be averaging 110 years by the second half of this century, in which case drawing down the capital just seems too risky by far. John, there's some signs that life expectancy has stopped increasing for the old. 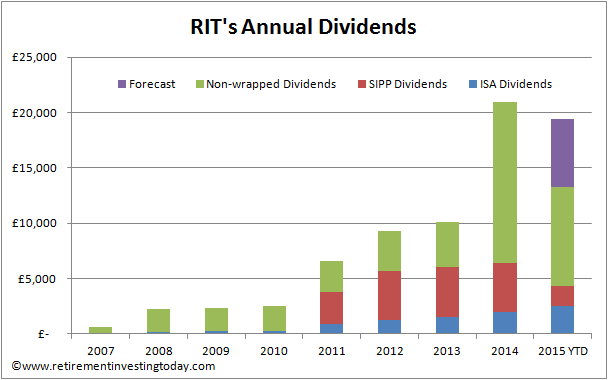 Fascinating to read RIT - as this is something I have been thinking about for a while. We have the home (but a sizeable mortgage that I am currently doing my best to pay down as fast as possible), but no car (dont really need it in London), but the question is if we were to retire would we move out of London? Originally my plan was a simple "Live off 50% of the dividends and reinvest the rest to ensure I keep an increasing income stream", but the more I have looked into it the more I needed to work through how it would actually work and avoid the risk of divi cuts etc. Just the thing for you, RIT. Good to see some detailed planning and forecasting. And that's with assuming you spend the part of £14.5k assigned to car depreciation / house repairs? So would even be some margin to pull back if needed? (Apologies if mentioned above).